SATIVEX, which is pure THC extracted from cannabis plants, could be 'airlifted' to Britain, as MS sufferers and others, all over the country, go to their doctors demanding the drug. Sativex is made by extracting the active ingredients of cannabis from 'skunk' plants, which are grown indoors under a 'Home Office' license, in a 'secret' location (Porton Down), 'somewhere' in Britain. The same effect can be achieved by making a cup of tea using cannabis, but this is illegal under the 'Misuse of Drugs Act'1971. Thanks to the Misuse of this law (1971-2005), medical cannabis 'compassion club' distribution networks have recently been shut down, or laid under siege in 'New Cromwell' purges against 'organic' users of natural cannabis in Britain, who are being treated like witches were in the Middle Ages. People who use cannabis for the relief of pain or other symptoms have been cut off from their guaranteed pure quality supplies, or had them interrupted, and some are getting desperate. Jeff Ditchfield, a leading medical cannabis campaigner, is planning a 'Sativex Airlift' to get the drug as quickly as possible to members of his 'Budbuddies' organisation, based in Wales, who get a legal prescription from their doctor. He says: "We are going for a freight company, an application for an import license, and a Pharmacy in Canada to fulfill the prescription. Once that is done we will then approach the members Health Authority to see if they will fund it." The government have recently said that people can get 'Sativex' legally from their doctor as an unlicensed drug, but because it is unlicensed, it is only legal if it is imported from Canada. This is despite the fact that the drug is supplied by a British company, GW Pharmaceuticals based in Porton Down, England. Doctors also have to make a special application to the Home Office on behalf of each patient, and they have complained that their insurance does not cover them for prescribing unlicensed drugs. "It's mostly just what they call 'soap bar' on tap down the pubs, and you can't cook with that, it's not cannabis. I've already asked my doctor for satisvex, but he said he had to write to the Home Office which could take some time. He said no to worry as it might not work as well as the skunk I was getting by mail order from the place he told me about, but they've suddenly stopped sending the parcels." 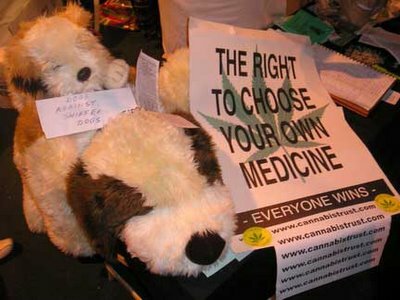 Last week BudBuddies wrote to all of it's medical members requesting they visit their GP to order Sativex 'on a named patient basis' as announced by the Home Office. One member has already had Sativex prescribed by their GP, but so far she has yet to receive it. • BudBuddies have just joined the blogosphere with an on the spot 'bud blog'; worth a look for 'news of the weed' from the welsher side of the border. 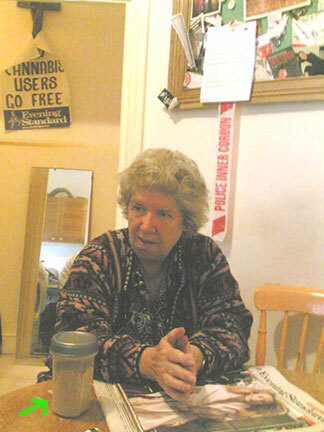 cannabis grandma: "I don't Want No Satisvexion"
PAT TABRAM, the Cannabis Grandma, has told 'News of the Weed' that she does not intend to ask her doctor for Sativex, although she would probally be eligible to use it, and she would not take it even if she was offered it. "I am not condeming Satisvex, or anyone who uses it, but just as Tony Blair has said he is "terrified of drugs", I am terrified of pharmacological prescription drugs, which have made me very ill". Currently in London to attend the government sponsored 'Tackling Drugs, Changing Lives' Conference she said: "Sativex has got alcohol in it, and I do not drink because my father was an alcoholic". She points out that Beta Interferon costs £200 per week per patient, Sativex costs £100 per week per patient, paid by taxpayers in this country. On the other hand, she says "Cannabis chocolate costs £7.00 per patient, but is free to them, because the cannabis community donates the cannabis and the chocolate, and THC4MS distribute it. Pure cannabis in food is free (if home grown) to £10 a week per patient, paid for by the patient, or their relatives". "Tell me which one is most beneficial to the patients and the NHS financial problems?" asks the Cannabis Grandma, who makes her own hot 'bud' chocolate, as well as 'traditional' chicken and leek pie with cannabis. "Since 1975 I have collected fourteen side effect illnesses from prescription medicine, and I am afraid to ever use it again. I now medicate with fresh cannabis bud in my food". "How can I and millions of other people in my position, obtain and use fresh 'organic' cannabis, without the fear of prosecution". 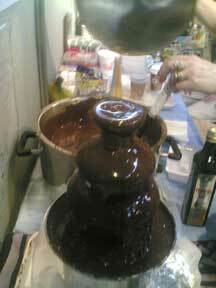 • Professor Grinspoon, a leading expert on medical cannabis, has said in an interview that Satisvex tastes "horrible". • The 'Rolling Heads' have announced that they will be releasing a new single. The 'A' side will be called 'I Can't Get No Sativection'. The 'B' side will be called 'I Don't Want No Sativection'. mystery court summons for THC4MS + how to get satisvex® + safe? just? tolerant? THE THREE THC4MS 'conspirators' being charged with conspiracy to supply cannabis chocolate, have mysteriously been summoned by the trial judge to an unscheduled hearing this Wednesday for an "announcement". There may of course be no connection, but this happens to be the same day that Home Sec CHARLES CLARKE is also expected to make an "announcement" at a government sponsored 'National Drugs Conference' in central London. While we wait to see what happens ('News of the Weed' will be at both places at the same time), it is not too late to gain immortality by signing the THC4MS petition now if you want to give some support - it does not take long. Often it is the little things that count. a) your personal details - full name, address, age, gender. b) a brief indication of the clinical need. c) the dosage total amount required (the manufacturer, GW Pharmaceuticals can help with this information; tel. (01980 557026), or email enquiries@gwpharm.com). GPs should forward this information to: Mike Evans. 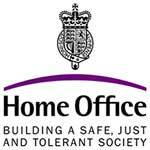 Home Office, Drugs Branch, 6th Floor, Peel Building, 2 Marsham Street, London. SW1P 4DF. 'News of the Weed' says: It all sounds more or less acceptable as an emergency stop gap measure, but while we wait (since 1971), and while good people like THC4MS and the Cannabis Grandma continue to get harassed, the jury is still out on New Labour's current medical cannabis policy, which is neither safe, just, or tolerant. 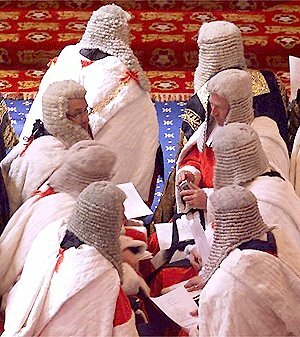 MEDICAL CANNABIS users and suppliers who are prosecuted under the cannabis prohibition laws (1971 Misuse of Drugs Act), have been effectively banned from using the best legal defence argument they have, thanks to a decision by three House of Lords 'Law Lords', Lords Bingham, Carswell and Rodger. The three guilty 'Law Lords' from the 'House of Lords', the 'highest' court in the land, (pictured above), have rejected a 'petition to appeal' to them after the 'Court of Appeal' rejected appeals by lawyers in several medical cannabis cases in which the 'medical neccessity' defence was refused by the original trial judges, who would not even allow juries to hear it. The 'medical necessity' defence argues (simple version); that as it is legal to 'steal' a boat under English Common Law if you are doing it to save someone from drowning, or yourself from drowning, it therefore must be legal to use, or supply cannabis, if this brings effective relief to a person suffering pain or disease. 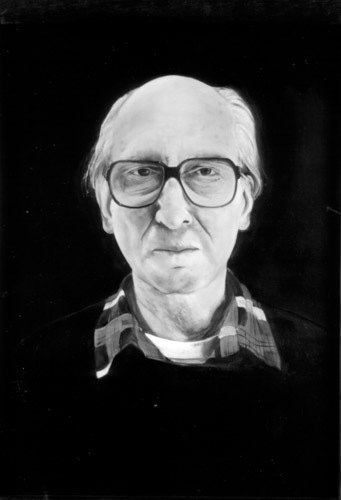 In one case heard by the Appeal Court (Jeff Ditchfield, Bud Buddies), the original trial judge allowed a jury to hear the medical necessity defence and he was aquitted. However the Crown Prosecution Service chose to appeal his "not guilty" verdict. His aquittal stands, but the the Court of Appeal said in effect that he should not have been allowed to present his 'medical necessity' defence. "Permission is refused because the petition does not raise an arguable point of law of general public importance which ought to be considered by the House at this time, bearing in mind that the cause has already been the subject of judicial decision and reviewed on appeal." 'News of the Weed' translation: "Go away and die in agony, we don't care; people who are sick are so dispensable we can't be bothered to even listen to their pathetic appeals for mercy. 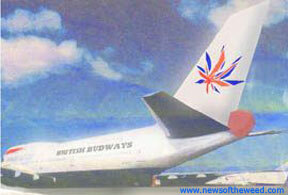 Buy shares in GW Pharmaceuticals, and score off them, or the cops will kick your door down on the shareholders behalf." 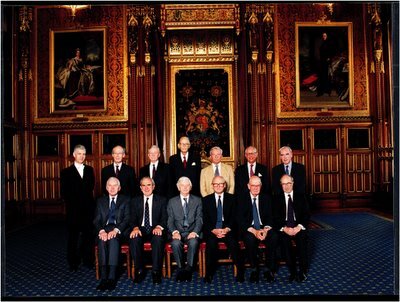 When 'News of the Weed' rang up the House of Lords, a clerk told us that the Lords were "finished" with the case. The decision comes as a blow, and a surprise, to those involved in the case, especially as it involves LORD BINGHAM of Cornhill, who is the most senior Judge in Britain (not to be confused with Lord Bingham, son of Lord Lucan), and is considered to be one of the most in touch and generally 'cool' Law Lords ever, having gone on record to call the cannabis laws in Britain "stupid". 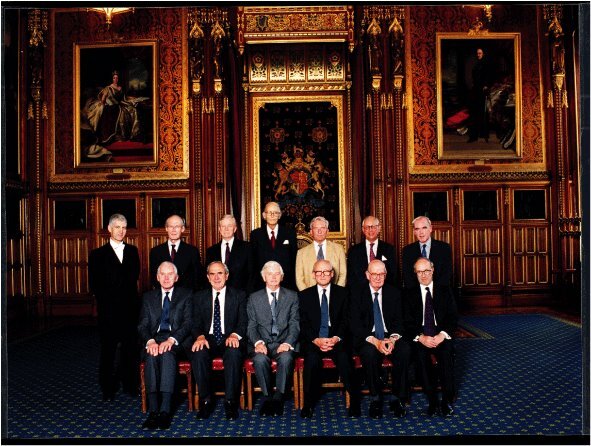 Lord Bingham (right: portrait by Cathy Fenwick) said; "It is stupid having a law which isn't doing what it is there for ... Everybody thinks our system is becoming soft and wimpish. In point of fact, it is one of the most punitive systems in the world." (Spectator 2002). There is an fascinating lecture by him online about the future of Human Rights in Britain, which considering he is the 'Lord Chief Justice of England & Wales', and has raved about the "the priceless gift of individual freedom", is worth a read. However, Lord Bingham's 'Human Rights' street cred may not save him from grief in this case, because the Law Lords decision on the 'medical necessity' defence is a massive snub to BARONESS RUNCIMAN whose credibility is excellent. She chaired the 'Police Foundation Report of 2000' which called on the government to specifically allow the 'necessity' defence for medical users. In the last few years many people have been acquitted by juries on this basis of this defence, thanks in part to her work. 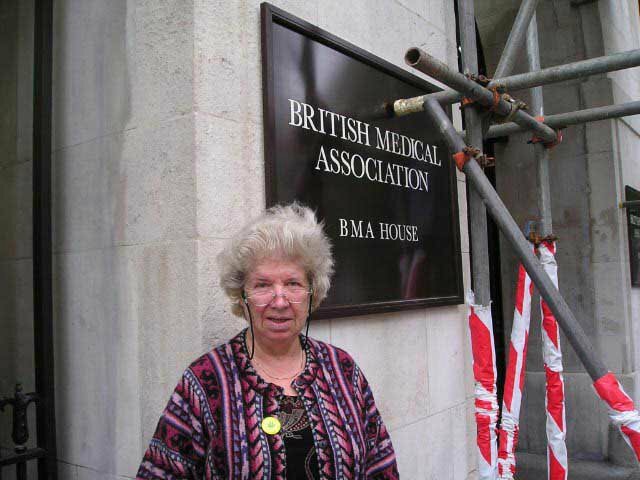 At a recent drug policy conference Baroness Runciman was shocked to be told that people were still facing prison in Britain for their use of medical cannabis, in fact she would not believe it, and got quite heated on the subject. She needs to talk to the Cannabis Grandma who not only faces prison, but eviction from her home, just for using medical cannabis. The 'Law' Lords decision comes as a further blow to medical cannabis users like CANNABIS GRANDMA who want to use a natural 'organic' preparation of the cannabis herb for medical purposes. It comes after a series of well publicised raids and arrests of medical cannabis users and suppliers in Britain, such as the Cannabis Grandma and THC4MS. Cynics who said these arrests were the ground being prepared for the sale of pharmaceutical cannabis products may have been proved correct with the launch of Sativex® and the subsequent rise in the value of GW Pharmaceutical shares, which were as low as 59p earlier in the year and are currently up to £109.50. Interestingly enough the THC4MS defendants have just been summoned to an unscheduled court hearing this coming Wednesday, the same day as the Home Secretary, CHARLES CLARKE (who has admitted more than inhaling cannabis in his youth), is due to make a major speach on drug policy. Will THC4MS be offered a deal; use Sativex® and the prosecution will be dropped? "It is now a matter of urgency that the Director of Public Prosecutions issues guidelines to all his Crown Prosecutors telling them not to prosecute medical users at least where there is clear medical evidence provided. The government always stated that medical users would be treated sympathetically by the criminal justice system – we say they should not be there in the first place". Now the only recourse left is an 'appeal to appeal' to the European Human Rights Court, which is currently being prepared by lawyers for some of the Appeal Court appellants. In the meantime medical cannabis users facing prosecution can try to persuade the CPS that medical cannabis prosecutions are not in the public interest. Failing that, they can plead "not guilty", and seek to persuade the jury to return a 'perverse verdict' under the present mis-application of the law. 'News of the Weed' says: Sativex offers users guaranteed purity, and strength, and a legal path to the use of cannabis for medical purposes, all of which is good news. We say "congratulations" to GW Pharmaceuticals and Dr. Geoffrey Guy for managing to overcome all the hurdles they have had to cross to enable this to happen. However Sativex only works because it contains cannabis, and people who want to use 'organic' medical cannabis products, such as the THC4MS chocolate, should be allowed to do so. THC4MS should be given a license to supply medical cannabis to MS sufferers, and other licenses should be given to acknowledged experts in the field such as 'Tony's Holistic Centre', and others who follow agreed protocols. Instead we seem to be witnessing the 'pharmaceuticalization' of cannabis as outlined by PROFESSOR GRINSPOON, associate professor emeritus of psychiatry at Harvard Medical School, and a leading expert on medical cannabis. If this happens it will be to the detriment of public health in Britain. • 'I Can't Get No Sativexion' is to be released soon by the 'Rolling Heads'. Cannabis Grandma faces 6 months jail and eviction from her home. MRS. PATRICIA TABRAM, otherwise known as 'The Grandma Who Eats Cannabis' visited her local police station today, but it was not for a cup of 'tea'. Instead she got an invitation to appear in Hexham Magistrates Court, Northumberland on 22nd November, for what could lead to one of the cannabis trials of the century. Today police charged the 'Cannabis Grandma' with one of the most serious cannabis 'offences' you can get prosecuted for; "Production" which comes under 'trafficking' in Section 4 of the Misuse of Drugs Act, maximum penalty 14 years. She was also charged with possession of cannabis (powdered skunk, perfect for making hot medicinal beverages). Both charges were related to the discovery of four cannabis plants in her home in September, by Northumberland police. Due to the fact that she is currently on a suspended sentence for cannabis supply she also faces an automatic six month prison term on top of the potential 14 years, if convicted for the new offences. The Cannabis Grandma, 67, has also been warned by her Housing Association that she faces eviction from her home after police contacted housing officials to inform them of her arrest. Her housing officer has officially informed her that if she is found guilty she will face eviction from her bungalow home in Humshaugh, near Newcastle. The house was allocated to her due to her severe arthritis which made it impossible for her to use stairs. The prosecution have said they would like to see the Cannabis Grandma 'tucked up by Christmas', but the Canny Grandma is determined to defend the right to "keep myself well" by eating cannabis. 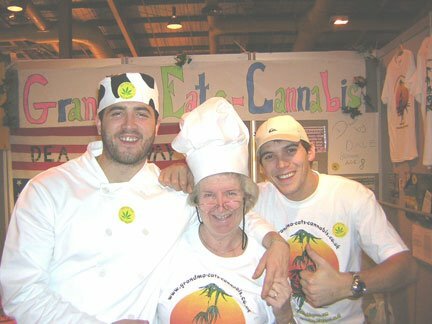 She has become famous for her 'traditional' potato & leek cannabis pie, and her cannabis hot chocolate beverage. Two years ago the then 65 year old pensioner was in a neck brace, used two walking sticks, was on a cocktail of NHS prescription drugs, had blotches all over her face, and had been told she would soon be in a wheelchair. Since she started using cannabis, the sticks, neck brace and blotches have gone, she no longer uses any prescription drugs, and she has been able to sleep soundly for the first time in years. GW Pharmaceuticals, the UK company given a Home Office licence to develop cannabis for medical use has just released the results of a study which demonstrates it's significant effect on easing pain and suppressing the debilitating symptoms of rheumatoid arthritis. Yet the government is still holding back on allowing doctors to prescribe GW's cannabis medicine, which is made by extracting the active ingredients of cannabis direct from the plant. This is the pharmaceutical equilavent of making a cup of cannabis hot chocolate using a few pinches of the herb. According to the Cannabis Grandma and thousands of others this works amazingly well. Their natural herbal method is also a lot cheaper than the GW Pharmaceuticals method. The Cannabis Grandma, who suffers from severe arthritis asks "Can someone please explain why it is deemed in the public interest to prosecute me and also threaten me with eviction from my home just for making my self better?" If found guilty this time the Cannabis Grandma will have two convictions for 'production' (growing cannabis) against her. Under the draconian 'Misuse of Drugs Act' anyone found guilty of 'production' three times faces a mandatory seven year sentence on the third offence. 'News of the Weed' says: Currently GW Pharmceutical shares are worth half their original value on the London Stock Exchange. If responsible 'self-help' medical cannabis users like the Cannabis Grandma and THC4MS are put behind bars, GW shares will probally go up in value. This will be thanks to the continued criminalization of the D.I.Y. competition, who will be eliminated in what is turning into a 'turf war' over who has the right to use cannabis for medical purposes. Gordon Brown take note: let people like the Cannabis Grandma look after themselves, and you will save the NHS billions, plus you will be a real hero for grandma's, grandpa's and grand children all over the country. Above: Cannabis Grandma, her son and friend at the Hemp Expo in Wembley last week end. For further information and interviews with the Cannabis Grandma please contact: 07976825086/07869125620. As part of the 'Use It, Don't Abuse It' cannabis education campaign, the 'Cannabis Trust', sponsored by the 'Global Marijuana Music Awards', is offering a free, 100% legal download of 'One Hundred Cone Billy', by Herb Superb, from his classic CD 'Potsongs' (P&C Darbalara Music / Undercover Music). The CD also features songs from the film 'Potluck' starring 'Chong' of 'Cheech and Chong'. 'One Hundred Cone Billy' is an amusing cautionary song regarding the daily consumption of large amounts of cannabis. It is worth the download just for the laughs; and it's a pretty sad and messy story, plus the music is good as well. Herb Superb was the 2004 Winner of the 'Global Marijuana Music Awards, Best Recorded Track' with 'Rollin Hills of Nimbin'. Entries are currently flooding in from all over the world for the 2006 GMM Awards, which will be held in Britain and look like being the most varied yet, with 14 categories of music covered. News of the Weed says: The 'Global Marijuana Music Awards' are great but they don't have a 'Garage' or 'Ragga' category so send them some samples and they won't be able to resist. More 'punk-hippy', 'neo-goth' and 'psycho-jazz' also required. Meanwhile, in case anyone still thinks that the only problem with cannabis is when you don't have any, the Cannabis Trust and the THC Club are offering the chance to test your self for cannabis abuse.